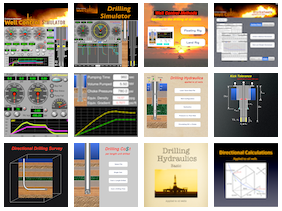 During drilling operation of oil wells, there may be inflow of formation fluids into the well, which is an undesirable condition. The driller should detect such events and closing the well immediately. Record information after the closing of the well corresponding to stabilization of pressure, volume gain, SIDPP (Shut-in Drillpipe Pressure) and SICP (Shut-in Casing Pressure. In the case of operations on floating units (subsea stack), this term could be redefined as Shut-in Choke Pressure). 1. 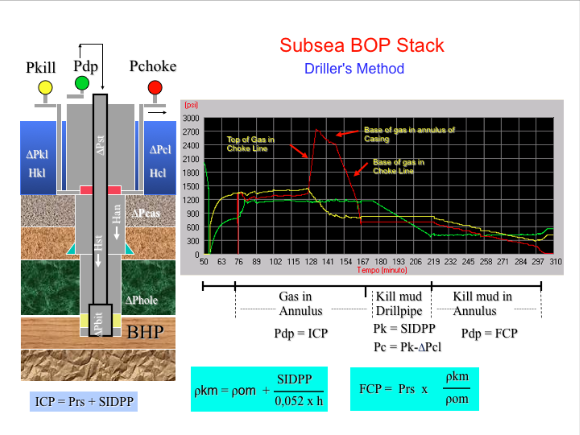 Fill the drill string until the bit by keeping the pressure at the Choke (at the KILL, on subsea stack) constant and equal to SIDPP. 2. Complete circulation of the annular to the surface keeping the pressure of circulation with the kill mud constant named FCP – Final Circulation Pressure. On subsea stack, after the choke fully open, the pump pressure increases until FCP 2. This method should only be applied with the drill bit in the bottom hole or when the kick is completely in annular of the drill string. To minimize errors of calculation of the kill mud weight, the calculations made in this application considers the depth of the drill bit instead of the depth of the well to calculate the kill mud weight. The formation pressure consider the depth of well. In case of top of the kick bellow the bit, it is recommended to apply the volumetric method until kick go through the drill bit to the annular, following then the driller’s method.